Ameba Wi-Fi SoC, Arduino Uno compatible Board. Ameba is a highly integrated Wi-Fi SoC, designed specifically for low power consumption IoT Applications. This chip integrates Wi-Fi, MCU, high-speed interface(USB and SDIO),serial interface (SPI, UART, and I2C), analog interface (ADC and DAC), and Ethernet and NFC. Ameba Board is Arduino Uno compatible. 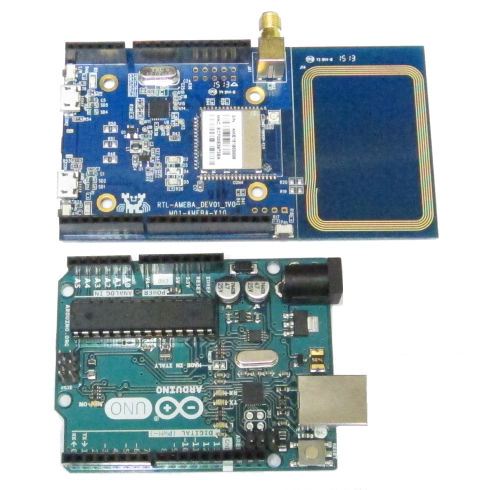 With official website and forum support, Wi-Fi, NFC, Low power and most Arduino libraries opened, this Board enables makers to easily implement their IoT prototypes. Realtek Semiconductor Corp., began with a small group of young, devoted engineers in 1987. Realtek now ranks 13th worldwide fabless semiconductor design house. Our product lines widely cover Communication Network, Personal Computer, and Multimedia. We efforts to provide the ultimate in pioneering IC technology — along with its firm commitment to creating unique and innovative designs for a broad range of high-tech applications. Copyright © 2016 O'Reilly Japan, Inc All Rights Reserved.